Come along and listen to what university students studying Japanese in the UK have to say! The finalists will give their speeches and presentations in Japanese to an audience of fellow students, teachers, parents, key figures from the UK-Japan world and a panel of judges. The contest will be followed by a reception. 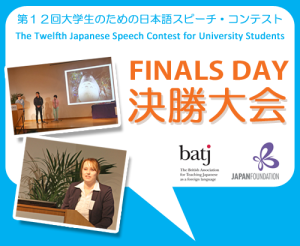 The Twelfth Japanese Speech Contest for University Students is organised by the British Association for Teaching Japanese as a Foreign Language (BATJ) and the Japan Foundation London in joint partnership. The event provides an opportunity for students from the UK and Ireland to demonstrate their Japanese speaking skills. Free entry, no booking required!